You know the stories where someone is granted a wish, but then that wish backfires? I feel like this is what happened in the metagame this weekend at Roanoke Regionals. Zoroark-GX Control was the boogieman — I spent a whole article last week talking about how to defeat it, and concluded by saying that I didn’t expect it to keep dominating. Well, I was right: as most players hoped, Zoroark Control was nowhere to be seen. However, its demise was brought upon, in part, by the rise of stall decks* — and now, players must face an even more hated threat. Soon, they’ll wish Zoroark was back in Control. Alright, alright, I’m being a bit more dramatic than necessary for the sake of the narrative. In reality, there were a number of reasons for Zoroark Control’s decline. As I and many others predicted, players adapted to it by either playing decks with a favorable matchup against it, or teching for it. One need only to look at what made Top 8 in Roanoke: Gardevoir-GX, Blacephalon-GX/ Naganadel with two Energy Switch, Zoroark-GX / Decidueye-GX / Alolan Ninetales-GX with Larvitar… it’s no wonder that Zoroark Control didn’t do well in such a metagame. In a similar vein, stall decks are the big topic of discussion right now, their success inevitably dredging up the familiar debate about whether Lusamine should be banned. However, if you look at the actual results, their success was relative. Of the 55 known decks in Day 2 at the time I’m writing this, only eight were stall decks (all of them had some combination of Hoopa, Regigigas, and Shuckle-GX), and none made Top 16. It’s true that even this modest success is more than what we’re used to, but, objectively, stall decks are not dominating. They’re just on the map now. In addition, stall decks are not the only new deck to worry about. Gardevoir-GX had potential, as evidenced by Robin Schulz’s top 16 finish at LAIC, but it’s now one of the major threats of the format. Charlie Lockyer’s Day 1 undefeated run leading to a top eight finish with Lost March brought a lot of attention back to this deck. Blacephalon-GX / Naganadel was the most successful deck overall. However, in the end, these are all details. Stall decks seem to have passed a point where they’re seen as a legitimate choice rather than the stuff of weirdos — just like Wailord-EX did in Expanded last season. ** Since most people don’t like playing against them, this is worrying to a majority of the player base. So, how do we deal with them? * I’m one of these purists who feel that the name of “mill decks” doesn’t convey what these decks actually do. There’s no actual milling card now that Team Rocket's Handiwork rotated; the decks only win by exhausting the opponent’s resources. ** Incidentally, I think this will hurt them in the long run. Players will start taking them seriously and preparing for them instead of just assuming they won’t run into them. *** Is “French people eat snails” still a stereotype? I don’t know. Please purchase a subscription to come discuss this important matter in the Subscribers’ Hideout. Magcargo-GX / Magcargo is not a new idea. To be honest, the two cards are blatantly designed to be played together: they evolve from the same Basic which saves space in the deck, and their Abilities combine perfectly: you can use Smooth Over to place a basic Energy on top of your deck, then Crushing Charge to attach this Energy to one of your Pokemon. With two Magcargo-GX and two Magcargo in play, you can use this combination twice, which allows you to attach two Energy in addition to your manual attachment. You can therefore power up Magcargo-GX in only one turn! Some will claim that it’s not realistic to have these four Evolution Pokemon in play. Magcargo’s Smooth Over, combined with a draw Supporter like Lillie or Oranguru‘s Instruct Ability, helps to set up your board, and you can use Ditto Prism Star as a fifth Slugma. That being said, it’s still a valid criticism — you’ll often face pressure early, especially if you go second, so you can’t expect to have an army of Slugma ready to evolve. Fortunately, you don’t need two Magcargo in play most of the time because there are other ways to control the top card of your deck. The main alternative to Magcargo is Mallow, which acts as a double Smooth Over. You can use Mallow to set up two Crushing Charges. It might seem redundant with the actual Smooth Over Ability, but, in most cases, it’s not. You can use Magcargo in combination with Oranguru to draw a desired card, then Mallow to guarantee hitting Energy with Crushing Charge. There are variations on the use of these two cards. For example, you can actually use Magcargo and Oranguru to get Mallow! This trick is particularly useful in situation where you need to hit two Crushing Charge but only have one Smooth Over at your disposal. The second way to control the top card of your deck is PokéNav. It’s not extremely reliable, but you can make some interesting plays with it. For example, you can use Smooth Over to put a Magcargo-GX on top of your deck, then use PokeNav to grab it. If there’s an Energy card in the two other cards, you can put it back on top of the deck and attach it with Crushing Charge; this may seem unlikely, but if your deck has 35 cards, 10 of which are Energy, your odds are basically 50-50. As you can see by these small examples, Magcargo-GX / Magcargo is more technical than it seems. Your overall goal is still to attach three Energy to Magcargo-GX, then discard enough to KO whatever you need, but playing it perfectly requires some technical skill — and sometimes knowledge of probabilities. With built-in Energy acceleration and high damage output, Magcargo doesn’t fear stalling strategies like Energy denial or walling with Shuckle-GX. But there’s one card in this deck that pushes this matchup from slightly favorable to a near auto-win: Victini Prism Star. The Victory Pokemon’s Infinity attack can bring all your basic Energy back into your deck, guaranteeing that you’ll never run out. A Stall player’s only chance to win would then be to trap high-retreat Pokemon such as Magcargo in the Active spot but, even if you don’t have Switch or Guzma, you can still attach Energy to the Active Pokemon and retreat, knowing that Victini Prism Star can recycle them. Finally, Victini Prism Star also OHKOs Hoopa, the only Pokemon other than Araquanid to wall Magcargo-GX. 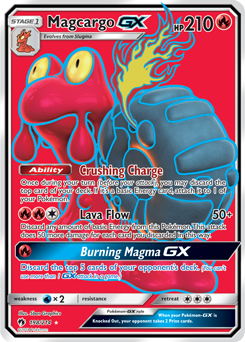 Finally, a quick word on Magcargo-GX’s Burning Magma GX: the name is cool, the effect much less so. It doesn’t fit into the deck’s game plan at all, at best acting as a deterrent so that the opponent doesn’t dig too deep into their deck. I tend to use the attack at the beginning of the game if I don’t have enough Energy to use Lava Flow, because there’s no other GX attack to use in the deck anyway. Sometimes, it can discard a key resource, like a Prism Star card; however, most of the time, it doesn’t do much. The comparison between Magcargo-GX and Blacephalon-GX is inevitable. Both want to get a bunch of Fire Energy into play, then use them to fuel big attacks at the rate of 50 damage per Energy. The differences include that Magcargo-GX needs Energy on itself, whereas Blacephalon-GX can Lost Zone any Fire Energy in play; Magcargo-GX can accelerate Energy to itself; and Magcargo-GX deals 50 damage more. With Blacephalon-GX being a Basic Pokemon, it seems like the winner in this comparison. However, Magcargo-GX has some advantages. For starters, it’s not an Ultra Beast. It’s not reliant on Beast Ring and, most importantly, it’s not weak to Sublimation GX from Alolan Ninetales-GX or Power of Nature from Sceptile. Its additional 30 HP also gives it an edge in some matchups, like Gardevoir-GX. To be perfectly clear, I don’t claim that Magcargo-GX is a better card, or a better deck, than Blacephalon-GX. 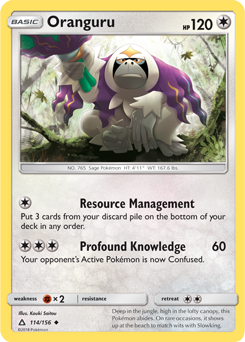 However, I believe it has some strong selling points, and is a separate contender, rather than a worse version of Blacephalon-GX. This is especially true in a metagame where Blacephalon-GX / Naganadel will be expected at every turn: Magcargo-GX / Magcargo has much less of a target on its back.